Welcome to another edition of the ongoing Friends According to SilentMode saga, thinly disguised as a set review. From here on in the sixth wave of Friends continues with the prominent jungle theme – and today we find out what role Emma plays, with this review of the Jungle First Aid Bike. 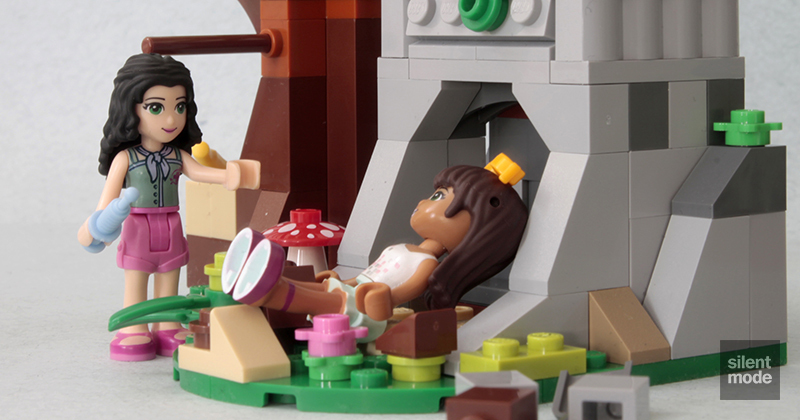 By the way: if you want a more family friendly series, check out the dedicated Friends fan site Heartlake Times: they have good, clean reviews of Friends sets, including this one. Besides noting that all the Jungle sets in the wave are prefixed with the word “Jungle”, there’s a special bamboo-style design on the sides of the box. Even though this is a GBP 12.99 set with flat sides, the design gives it the impression of the curved-style boxes used for more expensive sets. 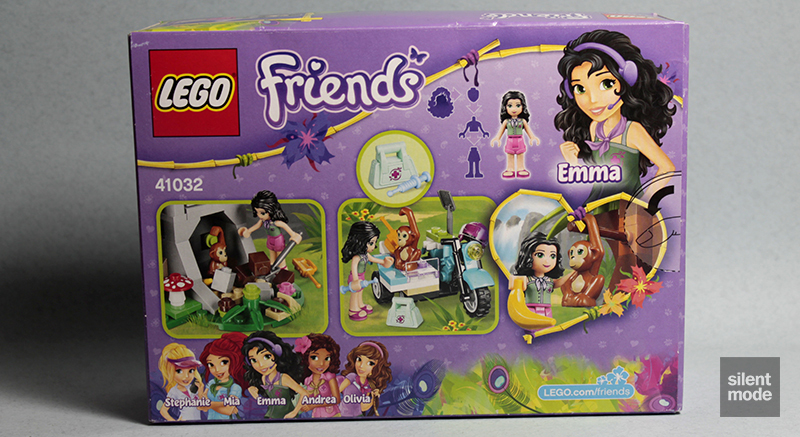 The back of the box features our favourite minidoll Emma in her jungle get-up, as well as the various play features of the set. 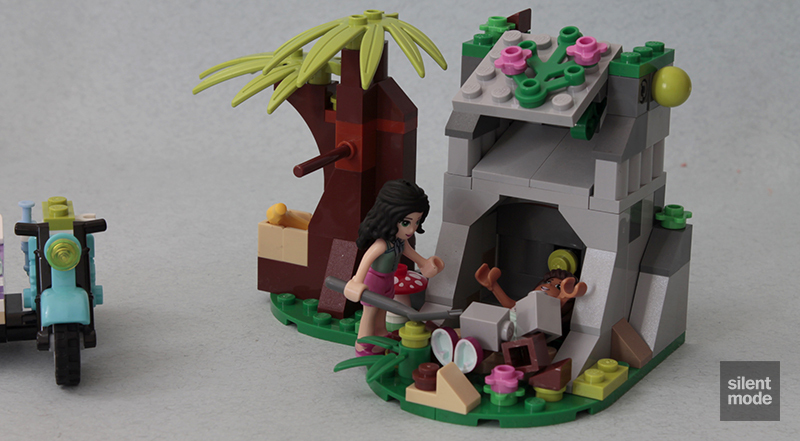 In fact, all the main characters have different outfits especially for the jungle, as seen on the bottom left. Emma was well-prepared for her close-up on the side of the box, as she poses for the scale reference. 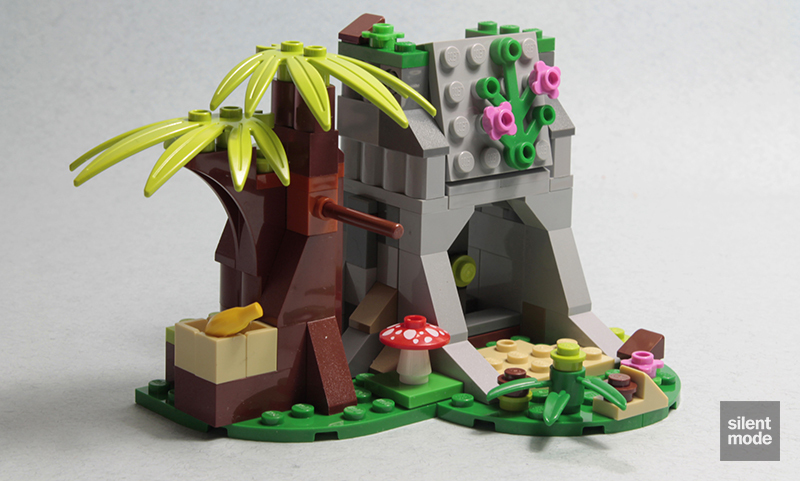 A review of a Jungle set wouldn’t be complete without our coveted Greenery section (although Jungle Tree Sanctuary somehow survived without one). The set is home to a small handful of uncommon Green parts. The 6×6 corner plate is present in four other more expensive sets, and is the only Friends set to have it. 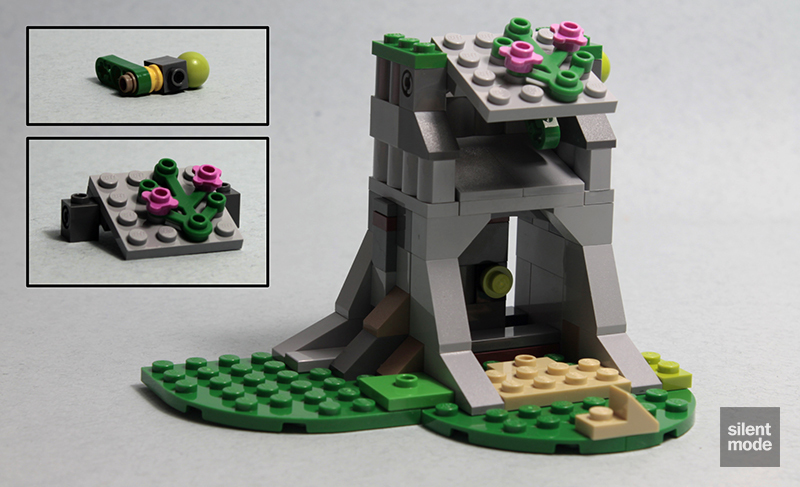 The 1×3 Technic liftarm in Green makes its debut in a non-Technic LEGO set right here. We also remember the 4×4 corner plates from Orangutan’s Banana Tree, and you’ll find the same number of them in Jungle Rescue Base. We’ve found another source of Lime swordleaf plant parts, also seen in Heartlake Shopping Mall, and a Bright Green 2×2 jumper plate – we’ve seen these before with Stephanie’s Soccer Practice and Tiger’s Beautiful Temple. If you’re interested in slopes, there’s a small array of them to enjoy in this set. The Reddish Brown 1x2x2 slopes made previous appearances in Springtime Scene and Olivia’s Newborn Foal. while the odd Tan cutout slope (shown in the next photo) is fondly remembered from Andrea’s Stage. The 4×2 slopes in Medium Stone Grey are ones to watch out for, since they’ve been more common in both older and more expensive/unusual sets. The first aid bag makes its debut – although it shares its shape with another Friends handbag – in this wave, also appearing in Jungle Bridge Rescue and Jungle Rescue Base. Something tells me there’s going to be a lot of rescuing going on this summer. Still exclusive to the Friends theme (for now at least) is the infamous 3×3 cross plate in Dark Orange, which makes its fourth appearance in a set (and still only one to a set)… it’s only a matter of time before it makes the crossover to other sets. My money is on it appearing in Medium Stone Grey, and either in a Creator or Architecture set. 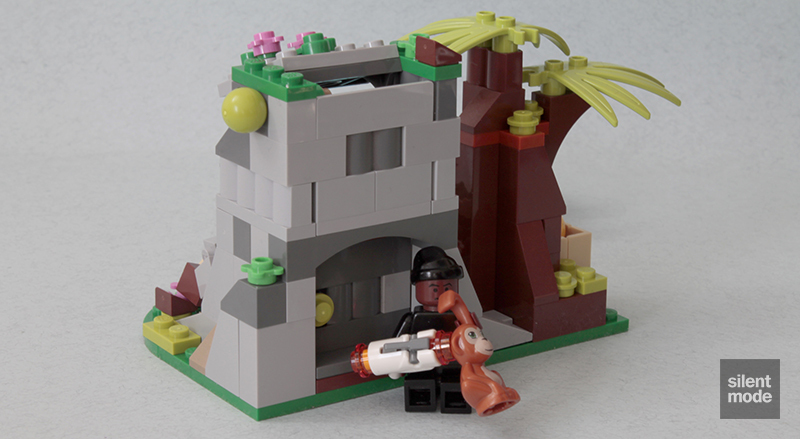 The Dark Orange 1×1 SNOT brick with one stud also makes an appearance, with it appearing in eight other sets, but you only get one of them. The same can be said for the Medium Lavender 2×4 plate, the Reddish Brown 1x2x5 brick and the 1x3x3 Reddish Brown arch, which are more plentiful elsewhere. On the bright side, this set is a good source for Tan 1×1 corner panels, which are fairly uncommon anyway. Also uncommon are a pair of Bright Light Blue syringes, which also make an appearance in Jungle Bridge Rescue. I’m not a fan of these new motorbikes, instead preferring the old ones from Town sets back in the day, even if they are small by today’s standards. It also seems most people aren’t fans of these bikes, as you’ll often find them on sale in grey market stores. For those who like these bikes, you’ll be pleased to know that this Medium Azure variation is currently exclusive to this set, as well as the Medium Azure mudguard. We’ve seen the Magenta aviation helmet before with Mia’s Lemonade Stand, and Transparent helmet visors have now become the norm. 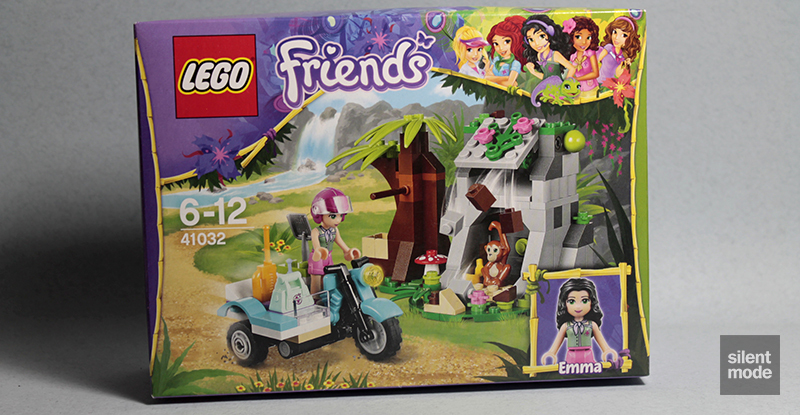 Emma is joined by the same animal we’ve seen in Orangutan’s Banana Tree and Jungle Tree Sanctuary, but this time referred to by LEGO as a monkey. As mentioned before, I’m not particularly thrilled or excited about this new animal to the scene – its commonality isn’t helping its case either. 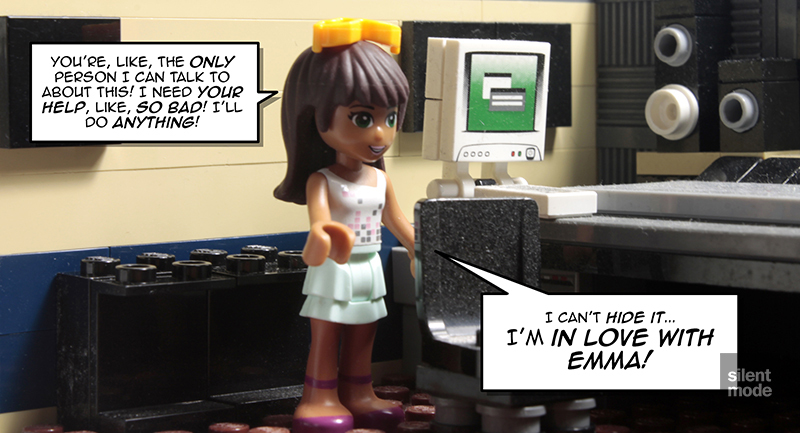 Emma gets ready for action as she grabs the Bright Light Orange communicator! Putting together these new motorcycles is as easy as pie: just snap the fairing on to the base, attach the wheels and you’re ready to go. But since this is a first aid bike, we have to add all kinds of other things to it. The bike comes with a sidecar, which is obviously a separate build that snaps on to the bike. It does this by way of a Technic axle on one side, that slots into the underside of the motorcycle. The complete vehicle demonstrates that there is some use for the new motorcycle, other than bulking out grey market shops. 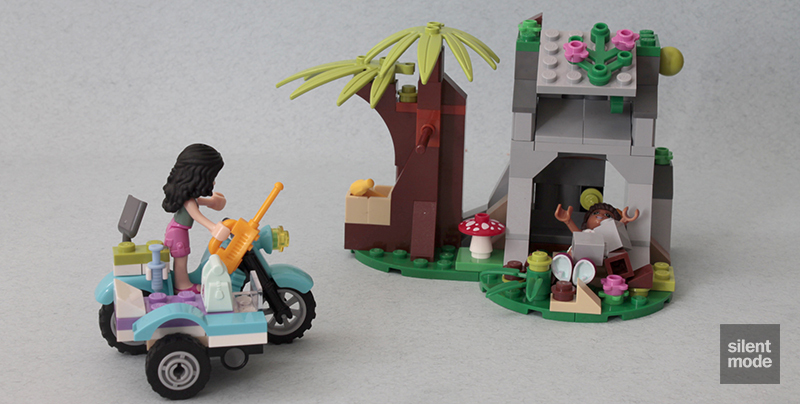 The downside is that the sidecar only has room for the helmet and first aid bag, and I don’t think a minidoll or even minifigure would be able to safely ride in it. But hey, it’s one way of making a sidecar! How many vehicles has Emma commandeered to date? 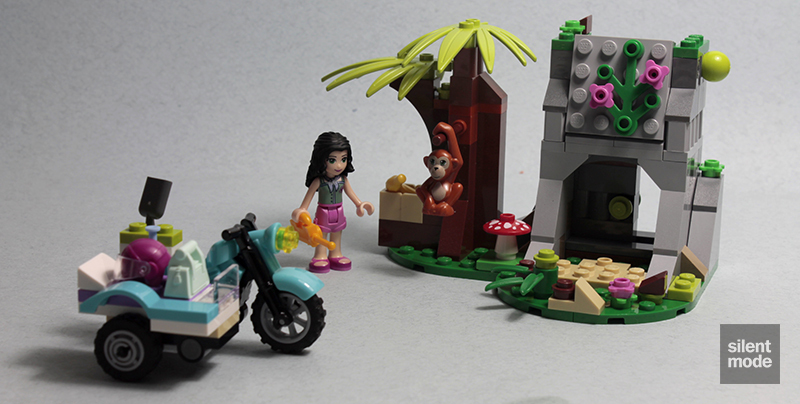 In a strange turn of events, the scenery forms the main part of the build. This is where slopeage starts to come into play, as well as all those large Green plates. One particularly cool thing about this set is this mechanism for a sliding door. I’ve never seen this be implemented in a set before, and when I started out as a MOCer I racked my brain trying to figure out how to make sliding doors… it’s cool to finally see one technique for building them at long last, and thankfully there are no special or hard to come by parts in sight. The sliding door mechanism is held in place by completing the roof of the cave, also helped by the protruding Lime 1×1 round plate on the door. There’s one on both sides, meaning the door can be opened without having to reach in. With the help of these Technic-aided builds, we’re also adding a mechanism to open and close the roof face. This provides yet another play feature, namely tipping rocks in front of the cave entrance. With the roof in the closed position, we add some 1×1 bricks to the inside of the roof to serve as rocks – there’s no reason you couldn’t use those spare 1×1 round plates you picked up from a PAB wall instead. Once the roof is loaded up, the rest of the scenery takes shape. Another one of those trees made up of Reddish Brown parts is built, but this time it has a swinging bar for the orangutan’s extended hand. 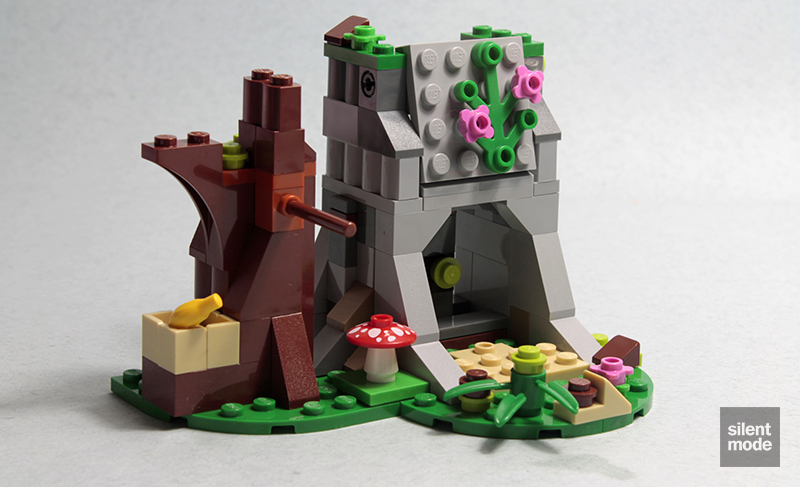 An obligatory poisonous mushroom, and a handy container for a banana are also added. Finally the swordleaf plant parts provide the icing on the cake. A generous selection of leftovers graces us, including a spare Bright Light Blue syringe. If you’re lucky you’ll be able to find these in Build-A-Mini stations, but it may not be worth it now that prices have increased. 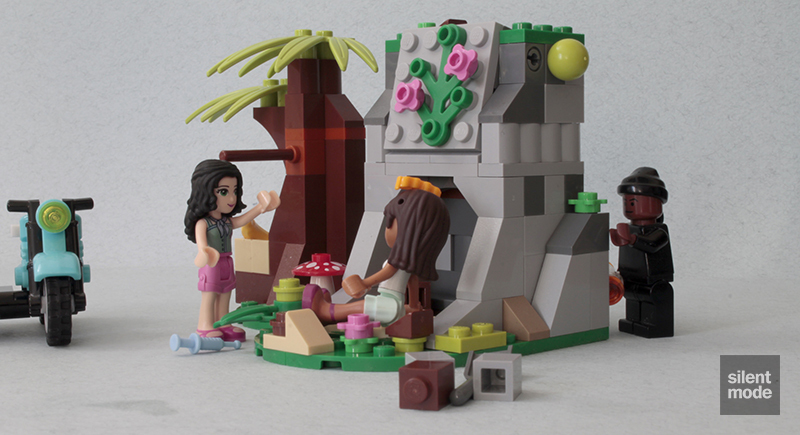 It turns out there’s more to this jungle theme than a few sets: you can go online and use LEGO Friends’ Story Maker, as well as take part in jungle-themed activities. At least, that’s what it looks like – I’ve got some kind of restraining order against me (no not really). The murderous Emma just won’t let her underhanded victory over Gewinne!th go. If you’ve read my other Friends reviews, you’ll know that Emma is my favourite of the five main characters – so you’re probably expecting me to be all over this set. Well that’s not quite the case this time. The main build is what interests me the most, as it can translate from being part of a Friends set to being part of a generic layout almost flawlessly. 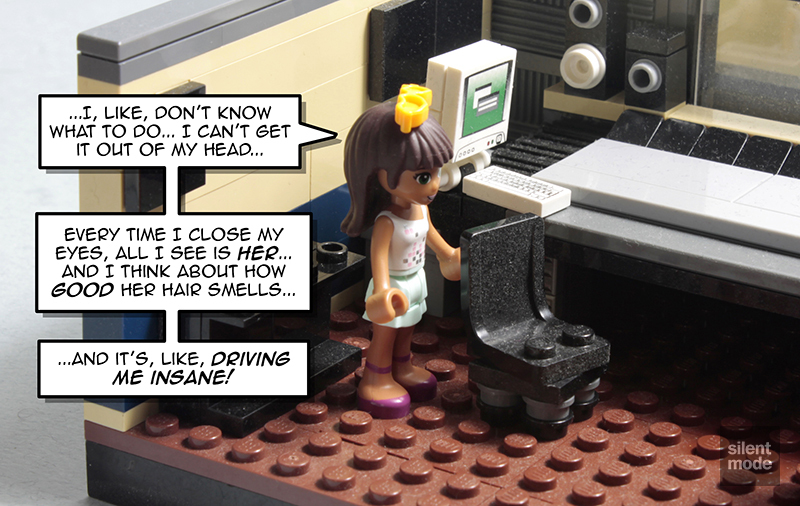 I’m particularly impressed with the sliding door technique, which I’m sure I’ll incorporate into future MOCs – good on LEGO for showing us how it’s done, because we know how those other MOCers like to keep things secret. 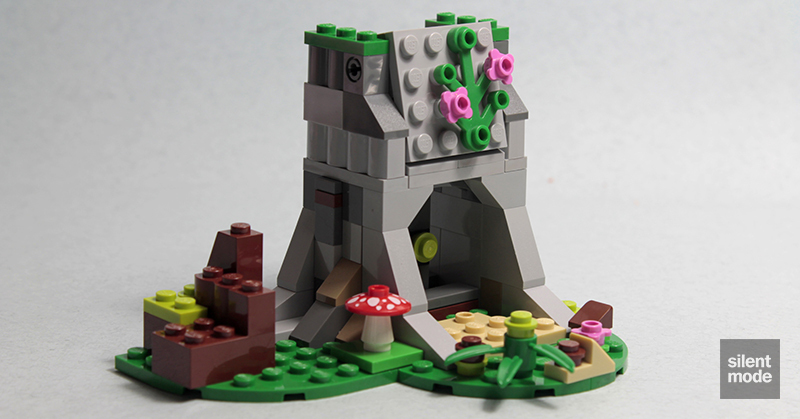 The roof is another interesting feature that definitely adds playability to the set, although I had just a little difficulty with keeping it closed to put the “rocks” in. It would be cool to increase the height of the compartment so that a whole bunch of rocks could come falling out, but that’s an easy modification we can add ourselves. I can understand the usage of the motorbike, and it’s great that the sidecar was added to it to give it a new lease of life (for those who don’t like the new motorbikes). My biggest dislike is the orangutan as the featured animal, even if it’s supposed to be a monkey this time: the bear from Brown Bear’s River would have been a better choice, given there’s a cave and falling rocks. As for Emma’s outfit in this set, it’s an interesting variation I can take or leave. Given the circumstances, I’m going to give this set 6.6/10.